For the second year running a GQA candidate and North Lancs Training Group apprentice has won the G11 award for apprentice of the year. Johnathon Peacock, who is currently working to complete his GQA Level 3 Advanced apprenticeship in Fenestration Installation and Glass Related Operations. 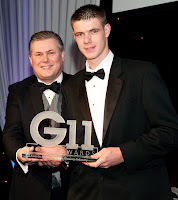 Johnathon was presented with the award at the London Park Hilton on 25th November at a glittering ceremony. The G11 awards celebrate the finest in the Glass and Glazing industry and is an annual event. Johnathon was picked from a number of entrants for the award and was rewarded for his commitment to his apprenticeship and his employer. Johnathan attended the event with his mother Hazel who commented “ I am really proud of Johnathan and what he has achieved, this is a proud moment for me and I would like to thank North Lancs Training Group for their commitment to his development and for the nomination “. Johnathon is employed by Goldseal Tradeline, a family owned installation company based in Chorley Lancashire, his employers Gareth and Richard Fairclough said “ Johnathan is a worthy winner, he came to us as a young lad with no experience but has turned into a good installer, we are really proud of him”. Goldseal Tradeline are a company who strive for quality in the work they do and for quality of customer service, Gareth commented “ as a company we have grown year on year, to help us grow we need good young apprentices like Johnathon and the apprenticeships help to develop people like him, they build in an ethos of a safe working environment and focus on quality and communication as well as the practical skills “. North Lancs Training Group Center co ordinator Paul Fairhurst said, “this is the second advanced apprentice that North Lancs have been connected with that has won this award it proves the recognition of the quality of delivery and of support from employers towards these qualifications, I also want to thank Neil Robinson from Proskills for forwarding on my nomination“. Johnathan is pictured receiving the award from Dave Broxton, MD of Bohle Ltd.